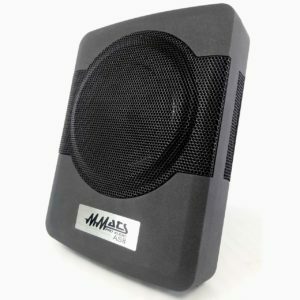 MMATS Pro Audio AS8 powered subwoofers for cars are the perfect way to add more bass to any existing factory car audio system or systems with no room to add giant subwoofer boxes. The slim low profile design allows fitting under or behind seats. Provides a solid increase in bass that will make your system so much more enjoyable to listen to. Perfect for lease cars that must be returned to factory original. 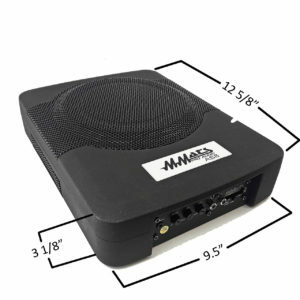 Self contained 230 Watt rms class D amplifier built in and high and low level inputs for simple installation in any car. Utilizing an 8″ woofer that weighs less than 11 pounds total and that includes the woofer, amp, passive radiators all in a tiny self contained metal cabinet. Try the AS8 powered subwoofer for your car and you will be amazed at the simplicity of the installation and the additional bass your car audio system will deliver. That missing bass that your system lacks will get filled in with a smooth solid bass that will make your car a more pleasurable listening environment.